I thought about how I could make the scarf since it was about to be something from scratch and I really didn’t want something plain. I had downloaded this e-book with quite a few, really beautiful knitting stitches. It is a free e-book – you just need to register if I’m not mistaken :). After looking through the pages, I decided I’d use the Staggered Fern Lace pattern. I cast on 50 stitches and worked 5 or 6 rows in garter stitch, slipping the first stitch every time. I then started working the first 5 stitches as well as the last 5 in garter stitch to form the border whilst knitting the Staggered Fern Lace pattern twice in the middle. I kept this up until I had repeated the pattern 4 times, and then, instead of the pattern (and keeping the same border), I continued in stocking stitch. When I felt it would be long enough, I started the Staggered Fern Lace pattern again (4 times) and finished it off with the same amount of garter stitches as the beginning of the scarf. 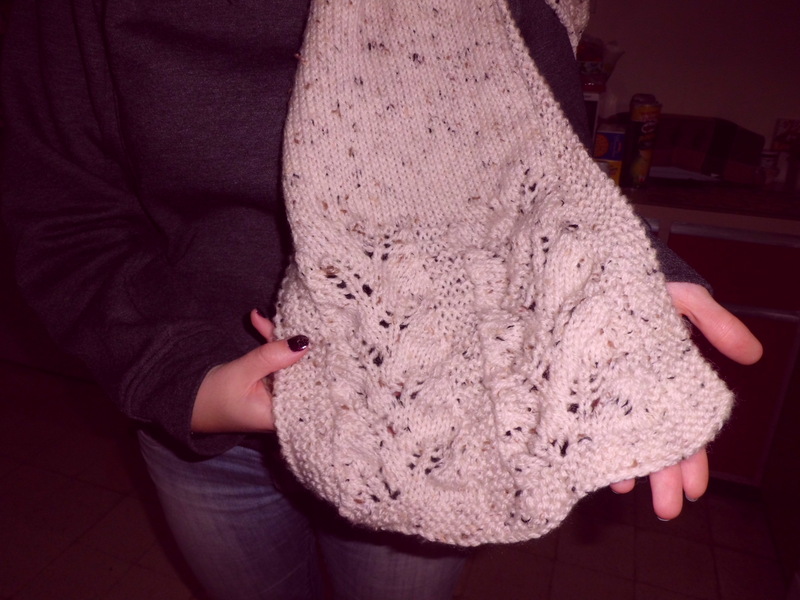 Don’t forget that I slipped the first stitch on every row throughout the whole scarf. A very warm scarf. Perfect for the winter months! Previous Dropped a stitch? No problem!